The importance of a good web hosting provider becomes evident in the instance where your website goes offline even for a little while, because it can mean serious financial losses for your company. So I’ve made up my mind to compile a list of the 10 topmost hosting companies to date. KnownHost takes a much deserved first place in my book. Their services are both affordable and proficient, and the VPS Managed Hosting from KnownHost is so close to perfection that it’s almost baffling. The VPS means that users have every reason to wholeheartedly renounce shared hosting for the far more superior resources, power, and scalability – all at a convenient price. It isn’t labeled a Managed service for nothing. Migrations to KnownHost and then backups are provided cost-free. Account protection, management of the OS, hardware and network maintenance, control panel installation and initial optimization, these are but a few crucial aspects which KnownHost takes full command of. The message I get from all this is that the web hosting company wants its users to be sure they’re in good hands and be exempt from any unnecessary hassle. KnownHost is remarkably confident in the uptime that their hosting secures. The 99.9% Network Uptime Guarantee is supported by the company’s 250 servers, and the steadfast promise which comes with the Service Level Agreement. In this case, when a user records downtime, she/he must signal this before 5 days have passed, by submitting a ticket at KnownHost’s helpdesk. What I find most interesting is that a drop of more than 0.9% in your website’s online presence is out of the question with KnownHost. If anyone decides to go with one of their VPS services (VPS-2 or larger), you should know that there’s a pleasant surprise in store for you: typing in the code KH15LIFE at checkout enables a lifetime discount of 15%, which will scale along later on if you upgrade. And don’t worry, as KnownHost has got you covered if you feel like backing out of the deal you’ve just made, the first 30 days being eligible for full refunds. WebFaction also ranks as a top-grade hosting provider, and for unique reasons. The kind of web hosting that WebFaction came up with derives from Shared, VPS, and Dedicated. In other words, it retains qualities from all three types. I know it sounds rather far-fetched, and yet I dare you to try this company’s 48-hour free trial; then you’ll know exactly what I’m writing about. Whenever something feels amiss, or the user reached an impasse with his websites, WebFaction’s supportive help team steps in to save the day. Other than that, here’s what I know about hosting with WebFaction. Their experts make sure the developer has SSH availability, while they configure, back up and monitor the servers, along with applying security patches and updating existing tools. 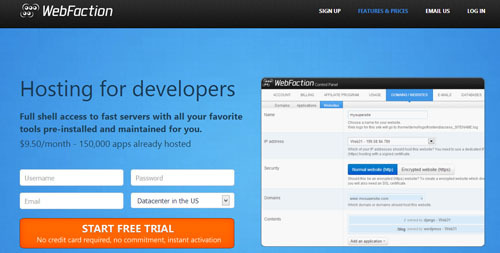 Moreover, PHP, Django, and Python are some of the pre-installed developer tools that WebFaction provides. In addition, approximately 50 applications are ready for 1-Click Installation, and then they work at lightning-fast parameters. Regarding the investment involved in hosting with WebFaction, I believe that the company’s services are more than accessible. A user may opt to subscribe for a whole year, or to go forward month by month. In the first case, a month of hosting is only $8.50, while taking it slowly is just one extra dollar per month. What is more, all users can turn back once they’ve started off with a subscription and then wish to cease it. Indeed, there’s plenty of time for that: 60 days, and the money is returned in full. (mt) Media Temple has 15 years worth of experience, and they were years well spent. 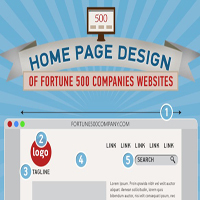 By now, the company has powered 1.5 million websites for 125,000 clients in 100 countries. It is safe to say that, since its inception in 1998, (mt) Media Temple has become an expert in hosting other people’s great ideas. The variety of clients who flock to (mt) Media Temple range from Web designers and Web developers, to small and medium-sized businesses, and giant brands such as Red Bull, Adidas, or Sony. This significantly vast clientele proves that the seasoned company provides impeccable hosting, regardless of how big or small their clients’ business is. I would also like to highlight how effective and responsive (mt) Media Temple’s award-winning support team is. DreamHost would be a fine choice for web hosting. This company has now come to host circa 1.2 million websites owned by 350.000 customers in its 16 years of experience. The shared hosting service, great for bloggers and web designers, is $8.95 per month. Alternatively, the VPS plans come with unlimited bandwidth and storage, and start from $15-a-month for 300 MB. An awesome offer is viable in September, namely that the user would receive the first domain registration and 80% off the price of a shared service each month, for a year. DreamHost has a 100% uptime guarantee, which anyone can test by signing in for a 30-day free trial with the shared hosting service. Finally, DreamHost also has the lengthiest money-back guarantee, which spreads for 97 days after the plan has been activated. Bluehost presents a most appealing shared hosting service, attached to unlimited domains, storage, file transfer capacity, and email accounts. Besides, it allows for one free domain and offers a free site builder with templates to use for your website. In addition, the first invoice in the case of Bluehost’s Professional Web Hosting arrives at the discounted price of $4.95. The first 30 days of hosting are eligible for a full refund, and after the first month is up, users can still recover what’s left of the value which was pre-paid. But before any commitments are made, anyone can try Bluehost’s free demo. HostNine surely deserves a place in my list of the most opulent web hosting providers. HostNine’s Shared, Reseller, Cloud VPS, and Dedicated services are altogether backed up by a 99.9% uptime guarantee, and for each hour of recorded downtime, the company provides one free day of hosting, which is cut out of the next month’s subscription quantum. Moreover, once a service has been activated, there is a 45-day window to renounce it and recover all investments. The current sales from HostNine focus entirely on users who fancy an upgrade: 50% off the first month’s subscription by using codes (H9LUV13 for upgrades concerning Cloud VPS, Reseller, and Shared hosting services). 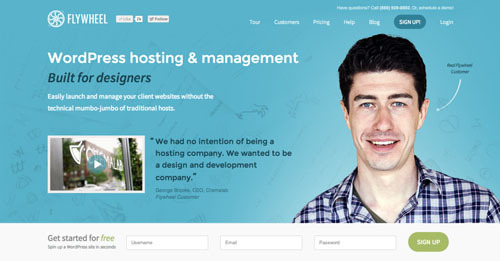 Flywheel provides web hosting at the height of excellence. The customers who would feel most at home are bloggers (because Flywheel is WordPress-ready), and website designers who freelance or work in an agency. The philosophy behind Flywheel is that the company wants to make things as easy as possible for designers, who we all know have to spend a lot of time administering websites instead of actually designing. Thus, Flywheel launches their users’ websites, than manages and backs them up, keeps them up to speed and protected. They thought of everything: from third-party reselling, to interacting with co-workers as hassle-free as possible (no usernames and passwords). In my opinion, Flywheel’s live demo is definitely tapping into, and it would make anyone see why hosting here would be great. 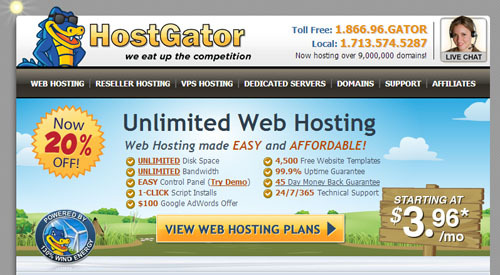 HostGator is a notable addition to this list, due to the fact that this provider has outstanding resources and offers great services for a modest price. The company relies on wind energy to power its ‘army’ of 12.000 servers which support the Shared, Reseller, VPS, and Dedicated hosting services. The network uptime guarantee for all plans is 99.9%, there is a 45-day money-back guarantee, and HostGator’s customer support really makes the grade. Finally, should the user activate one of the company’s Shared hosting plans (Hatchling, Baby, or Business), its first ever invoice is cut off by 20%. I have the heighest of opinions about Pixeno. Hosting with them would be a fine choice for all creative-minded professionals, who can ‘test-drive’ Pixeno’s functionality for a whole month for free. It’s enough to consult the reports about headquarters technology on the company’s website to feel impressed: their power supply is downtime-proof. Out of their diverse palette of services, the Personal and Reseller hosting clearly stand out for the use of web developers and designers. They provide every user account with unlimited subdomains, email addresses, and MySQL databases. In addition, every user ought to know that 4 backups take place during each and every day, and the information is kept for 2 weeks, which allows for 56 available restore points anytime. I wouldn’t dream of finalizing my list of favorite web hosting providers without telling you about WebHostingBuzz. Choosing to host with them is easy and affordable. As far as developers are concerned, a Shared hosting service is only $4.95 per month, and VPS is $14.95. But the best value is coupled with the WebHostingBuzz Reseller hosting service, which usually costs a monthly $9.95. Well, presently, the first invoice can be cut down to $1 by punching in the code “resellerdeal” when activating the plan. All in all, WebHostingBuzz is the place where win-win arrangements are made. Your forgetting VentraIP, Their service is well and above standard service their Facebook Page is often updated, If something goes down they will be the first to put their hand up and admit wrong, AND they apologies on Facebook if their Support requests are taking longer then an hour. The hosting is one of the cheapest I have seen, extremely cheap domains and heavyly stands against the biggest of provides. WIth an extremely fast first bit for a shared host and faster for VPN surely they are in the top 10 without a doubt. I am in no way a partner or employee just a very satisfied customer.